This page is a translated version of the page Eversharp and the translation is 100% complete. The Wahl Eversharp was founded as pens manufacturer in 1917, but in reality the company was founded in 1914 when the Wahl Adding Machine decided to expand and spearhead the first in the world of mechanical pencils, and then what of fountain pen. The company continued its activity until the crisis of the '50s. Activities stopped in 1957, when the division which produced the pens was bought by Parker. Despite Wahl Eversharp has not distinguished itself in the fountain pens history for turning point technical innovations it has always produced very high quality pens of the best level. The characteristic for which the Eversharp has shone in fact was the design, producing, at the apex of his success, some of the most beautiful pens ever made and distinguished by the wonderful achievements in Art Deco style. Thanks to remarkable success from its golden years it will be fully included, though in position less important than the other, between the Big Four. The Wahl Eversharp was born in 1914 as The Wahl Company, following the decision of the Wahl Adding Machine (a company born in 1905 that produced mechanical calculators) to expand its activities. This is one of the few cases in the early history of fountain pen of the century in which a producer of success starts from a company decision to expand into another business sector making an investment, and not from the commercial exploitation of an invention. The Wahl Eversharp activities in the writing instruments field began in 1914 with the launch of Eversharp mechanical pencil. For many times it was said that that was the same as the Ever-Sharp pencil created by the Japanese inventor Tokuji Hayakawa, that two years earlier had founded in Tokyo a homonym company, today still active as Sharp. But subsequent searches have shown that the Eversharp pencil was invented by Charles Keeran (patent nº US-1130741) in 1913 and then the invention was sold for production to the Wahl Adding Machine. In 1917, continuing with its expansion policy, Wahl Eversharp acquired the Boston Fountain Pen Company, a company that already started producing good hard rubber fountain pen characterized by a wheel clip. 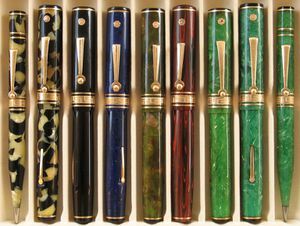 The pens were market branded ad Wahl, promoving them as capable to alleviate the wear on the edges of the pockets thanks to their peculiar Roller Clip. The new model, called Tempoint, was a big success and Wahl Eversharp climbed on top of sales ranking, but the unexpected success involved considerable problems for the production, which was not efficient. That is why the company invested heavily in improving production structures and in 1921 launched a new line of metal pens, called Wahl All Metal Fountain Pen for which they have prepared an efficient production line. These pens have not to be confused with an earlier production line, dated between 1919 and 1920, of overlayed metal pens, still using the Roller Clip. The attention production efficiency and the intent to pursue a policy of industrial expansion always remain a constant in the history of Wahl Eversharp, as well as the presence of wrong investment decisions, such the one that caused the decline and the end of the company. The first of these misplaced investments was, in 1922, the acquisition of a factory for the production of hard rubber tubes. This led to some of the most beautiful pens in hard rubber ever produced, but the investment was wrong, as it was done just before the advent of celluloid pens. Some Eversharp models from 1927. Throughout the first part of '20s the company continued to produce pens in hard rubber, the line Tempoint was completed in 1922, the pens in hard rubber produced since 1923 are called frequently by collectors Signature using the nib name. But despite being produced in many different versions both in style and materials, the company continued to refer to them simply as Wahl Pen. The pens were produced in different sizes depending on the nib, the wheel clip was reserved for models of biggest dimension, for nib measures 4 and 6, while to meet the military regulation was introduced a model with a elegant curved clip, welded directly onto the metallic head of the cap, with an elegant tulip shape, which is indicated by collectors as Tulip Clip, that was produced in two sizes. The pens were made in black or red hard rubber decorated with engravings, which in 1926 was added the Rosewood color. 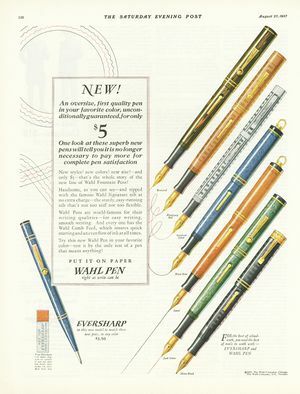 Due to the heavy investment made Wahl Eversharp was late on the field of materials and began production of celluloid colored pens in 1927, lagging behind competitors (between the Big Four only Waterman was slower to adopt the new material). Initially were introduced only three colors: Jade Green,Royal Blue and Coral while maintaining the production of hard rubber pens. The next year the company completely redesigned its line of products, going almost totally to celluloid, also for the Black and the Rosewood colors, and introducing the new Black Pearl color; but some of the new models still made in hard rubber can be found. The big novelty however was a revolutionary mechanism that permit to use different kinf of nibs on the same pen, called Personal Point. Up to 14 different nib types were available, which, thanks to a screw mechanism, could be mounted directly on the pen by the dealer. The mark of Gold Seal life-warranty. 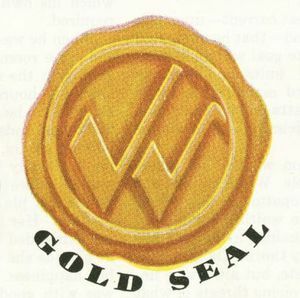 The same year was also introduced a warranty for life called Gold Seal, recognizable by the mark shown in the figure, as a response to the Sheaffer White dot. The Gold Seal remained in use, with some variation in size, on every model produced by Wahl Eversharp until the Skyline. The mark is made by two check signs to form a "W" that remind the name of the company. It happens sometimes to find pens in which the Gold Seal presents a hole, this is not considered a flaw because it was the company that carried out the drilling to mark the lack of guarantee for the models put into liquidation. Still in 1928 was added to the models line a new large pen, made in an art deco style and characterized by a band decorated with a greek motif, called by all collectors Deco Band. Initially the pen was produced in celluloid in the Jade Green, Royal Blue, Rosewood, Black Pearl and Jet Black colours, but there are some rare hard rubber versions in black and also red (extremely rare) engraved with a greek motif. In 1930 then was introduced the new Brazilian Green color, but the new pen, still mantaining the same dimensions, also had a different cap band. In 1929, with the success of the Streamlined style introduced by Sheaffer with his Balance model, Wahl Eversharp launched the Equipoised model, with slender form. The first version of the pen, for its excessive similarity with the Balance, was restyled almost immediately, to reach its final form, which had streamlined body and cap ended by a conical shape, in 1930. It was produced in the same colors of the celluloid Deco Band, but there are some rare color like Oxblood (blood red and black, called also Flamingo) and Bumblebee (yellow and black or yellow and blue), used mainly in desk sets and ladies pens. Advertising for the Doric model in 1931. But the real masterpiece of Wahl Eversharp was born in 1931: the Doric a celluloid multifaceted pen, in pure Art Deco style, which is said to be inspired by the columns of Greek temples. The new pen, one of the most beautiful pens ever built, was made of celluloid, in five colors with exotic names, Kashmir, Morocco, Cathay, Burma and the classic Jed Black. To those was added, although it did not appear in advertising and was produced only for a very short period, the Black & Pearl, which therefore is very rare. In the same year, the Wahl Eversharp also launched an economic sub-brand, the Oxford, still made in celluloid and using gold nibs. These pens, although economic, are almost of good quality and had an excellent value for money. For most of the '30s the production of Eversharp is dominated by the Doric and will see the introduction of the Adjustable Point nib in 1932, a redesign of the pen in 1935 and the introduction of the Ink Shut-off mechanism in 1936, which was also adopted by the new model Coronet, another Art Deco masterpiece. The Ink Shut-off, illustrated in the figure, was just another wrong investment: promoted as a mechanism capable to block the flow of the ink form the pen when the pen was closed, to prevent leaks because of pressure changes, (as was the case when travelling by plane, activity that was booming) it was indeed ineffective, so that the company was forced to withdraw it from the market by an order from the Federal Trade Commission. 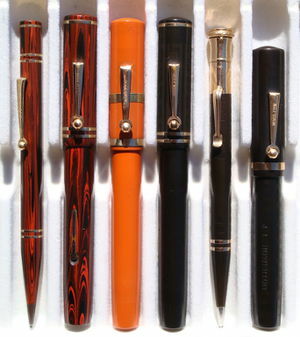 Around 1935, following another innovation made by Sheaffer after Vacumatic launch, were also introduced new Doric models with transparent body and new filling system (called plunger filler), the same filling system was adopted even for some economic models, similar to the Doric but produced in round smooth celluloid. In the late 30's, despite the introduction of other economic models such as Pacemaker and Air-lite the Wahl Eversharp was constantly losing market share. That is why in 1940 the company did a complete restructuring, the Wahl Company was merged with the subsidiary becoming the Eversharp Inc. and the direction was entrusted Martin Strauss who in 1941 launched the new Skyline model. Again company distinguished itself by the revolutionary design of this pen, entrusted to Henry Dreyfuss design, and thanks to a successful promotional campaign, the Skyline realized strong sales, bringing another time Eversharp at the top of the market; but it was also the last successful model produced by the company. In 1943, in an attempt to follow the success of the Parker 51, was introduced Fifth Avenue, a plastic model with hooded nib, which unlike the 51 had limited success. The bulk of sales remained that of Skyline so that in 1946 the line Fifth Avenue was retired. Despite the company was solid, Eversharp was again facing a period of decline. Ironically it was the decision to invest heavily on technical innovation over a revolutionary invention, the ballpoint pen, to inflict a mortal blow to the company. In 1945 the Eversharp began to take an interest in the development of the ballpoint pen acquiring the rights to use the Biro pen the by Argentine producer Eterpen Co., but before the launch of its CA (Capillary Action) another company, the Reynold's International Pen Company put on the market another ballpoint pen. That gave rise to a furious legal battle, that was lost since the invention was already covered by an expired patent from 1888. Despite this, the Eversharp launched the new ballpoint pen in 1946, obtaining good results in the short time, but the success was brief and immediately unleashed a price war with competitors. Also in a brief time it became clear that the new technology was immature: most of these ballpoint pens in fact worked in a partial way and Eversharp had to bear huge costs for pens returned back in warranty, which involved large losses due to the strong investments made both for the advertising campaign and for the creation of the production facilities for the new pen. The failed investment in the ballpoint pen production was a fatal blow to the finances of the company, it sought a revival back in its fountain pen traditional market, and in 1948 commissioned to Raymond Loewy, a famous designer, the creation of a new pen, the Symphony model. But even this model did not had a great success and Eversharp went gradually waning as its profits. The company ended up liquidating the production division to Parker in 1957. After that date only traces of the brand remain in the market, at the end of the '50s, for some economic pens made for Parker. 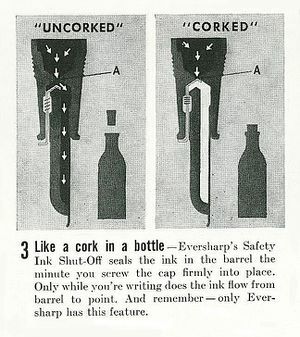 1940 the Wahl Company Co. and Eversharp Inc. are fused into Eversharp Inc.
 Website dedicated to the company, many photos, with some unique models. Chronology and articles index about the company in the Jim Mamoulides website. Brand page on Bill Aker website. An article on the early history. An article on the brand. Discussion about links with Kingswood. Discussion on the English production. ↑ one appears in this french advertisement dated December 1936 but in a 1935 catalog showed in this discussion a plunger filler Round Doric is shown. ↑ referring to the catalog showed in this discussion. This page was last edited on 17 June 2017, at 18:57.